Volunteer. Teacher. Leader. Motivator. Role Model. Inspiration. Hero. Coach. These words, and more, describe Mother of Sorrows alumni Sergio Alcala, whose unfailing commitment and passion makes a real-time impact in the lives of MOS basketball players. 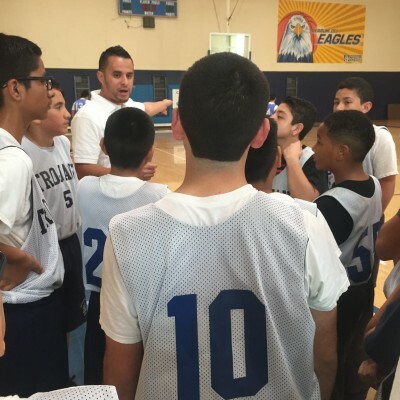 Coach of the MOS boy’s basketball team since 2013, Sergio was first introduced to the position by his brother, a then-student of Mother of Sorrows and basketball team member. When his brother said their team had no coach, Sergio half-joked that he would be their new basketball coach. Less than a day later, Sergio met with Principal Villarreal to discuss the requirements to coach at Mother of Sorrows. Three years later, Sergio can be found coaching the basketball team every Friday afternoon and occasional Saturday and Sundays, rain or shine. Sergio has always given back, finding a perfect fit helping, as he sees it, a new generation of leaders and good citizens develop their full potential. Sergio’s views basketball as much more than a game – it’s a valuable tool to develop the mindset and skills necessary to succeed in life. When actively coaching, leading team meeting or counseling a player one-on-one, Sergio intentionally looks for teaching moments. Sergio’s coaching and life philosophy is built on a foundation of teamwork, sportsmanship, perseverance and giving your ultimate best, whether on or off the court. Winning or losing, Sergio teaches his players that its their individual conduct and effort that counts most. This, according to Sergio, “is why I’m still coaching at Mother of Sorrows three years later,” and why he continually spends his free time volunteering. According to Sergio, one of his more memorable coaching moments came from a recent game in the Christmas Boys Basketball Tournament. In the middle of a hard-fought basketball game an opposing team member fell down, apparently injured. Rather than jumping at the opportunity to make an easy layup, Sergio’s player, Jesus Miranda, stopped driving, walked back to the injured opponent and helped him stand up. It was at that moment, with everyone watching, Sergio knew his team understood what he’d been teaching them all along – there are many more important things in life than winning. Mother of Sorrows School is grateful to count Sergio Alcala as a super-star volunteer!